Hey folks! As you probably have noticed, I've been skimping on the posts lately. Sorry about that. I'm on a self-inflicted writing deadline, and this month is going to be harsh. So I thought it would be best that I didn't stretch myself out too far and sacrifice quality. What does that mean? It just means I'm taking a blog hiatus for the rest of the month. I wish I could take a hiatus from work as well, but I don't think I could swing that. A laundry-dishes-vacuuming hiatus sounds good too. Shucks. In any case, I'll be back in November with more exciting author interviews and updates. In fact, if you're a writer who wants to talk about your work, send me an email at dorothyanndreyer [at] gmail [dot] com, and I'll get back to you about doing an interview or featuring your book. Also, I'd love to do another agent-judged contest, so I'll be looking into that after my hiatus as well. Stay tuned! Available now! 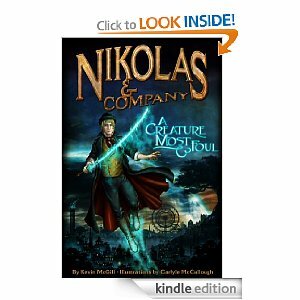 Kevin McGill's Nikolas and Company: A Creature Most Foul. I've read the first hundred pages of this awesome book and was sucked right into the fabulous world Kevin has created. The artwork is stunning and the characters will charm you. Give it a try, you won't be disappointed.